Meet the "Idol of Busyness"
I'm not sure exactly when it started, but somewhere along the line, I got the idea that the busier I was, the better I was doing spiritually. My to-do list has gained more and more significance. Its constant, nagging voice constantly drowns out the opportunities to cherish and build relationships. I wear my responsibilities as a badge of honor. It's almost like I should sew an adult size AWANA or Girl Scouts vest to display the many things I'm involved in on a weekly basis. Unfortunately, it gets worse. In my pride, I've even looked down on those whose schedules aren't as packed as mine. Of course they have time to schedule coffee dates or work on a craft with their toddler. They don't have nearly as many responsibilities (badges) as I do!! In a moment of desperation last week, I fell to my knees next to my bed and cried out to God. My mind had been a whirlwind of jobs and checklists all morning and I had lost my temper more times than I cared to admit. God, what am I doing wrong?? I've edited my responsibilities several times since last summer. I've been reigning in my overcommitment problem by being slow to say "yes". I've even been learning to cherish the quietness in life in order to more fully embrace the power of the gospel. Then it hit me, it's not a "doing" problem, but an "identity" problem. I've convinced myself that I am a more worthy wife, mom, leader, friend, etc..... when my to-do list is longer. If my schedule is hard to juggle then I must be doing a good job at ministry. When I am prepared and organized, my ego swells. When an entire day disintegrates before my eyes, I am a complete failure. 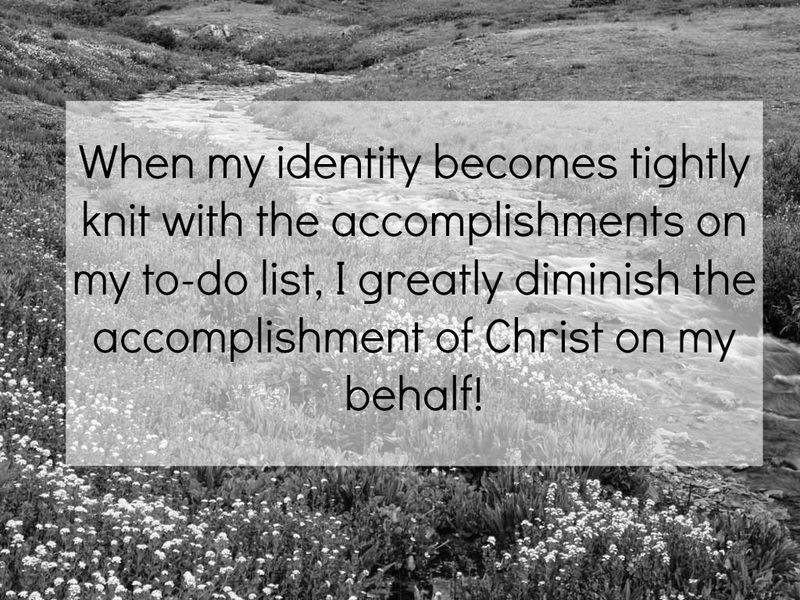 When my identity becomes tightly knit with the accomplishments on my to-do list, I greatly diminish the accomplishment of Christ on my behalf! To be transparent, I'm not exactly sure how to completely destroy the idol of busyness in my life at this point. I've repented of this sin and know I'll need His grace to fight this identity battle daily (or even hourly). Whether or not, I succeed with my to-do list, I know that I'm accepted and beloved in God's sight through Jesus' sacrifice for me, and I want to choose the "good part" (Luke 10:42) as Mary did. My heart truly desires to value my relationship with Him and with his people far greater than a silly to-do list. I would love to pray for you as you work on tearing down the idols in your own life with the power of the gospel.